Since I began my first full-time job last June, I have had the pleasure of getting to know many blessed souls. One in particular is Sylvia Sosa, whose spirited personality has earned her the nickname “Sylvia Saucy.” While Sylvia is quite “saucy,” I will remember her more for her generosity, which spills out of her large heart and blesses those around her. A fellow foodie and a native Chicagan, Sylvia’s family is originally from Mexico, and she has shared her wonderful (edible) heritage with me. 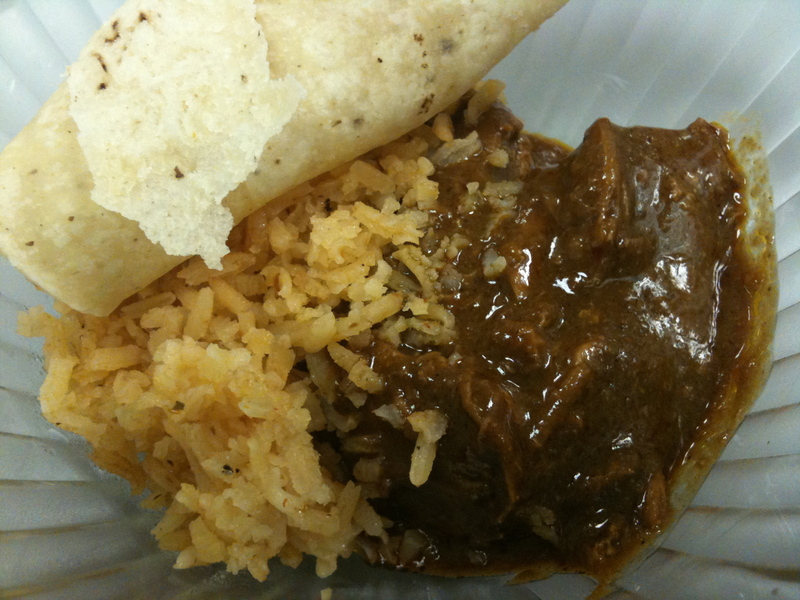 Julia made mole in college, which was my first experience actually tasting the nutty stew, almost curry-like in consistency, but I first read about it in Laura Esquivel’s Like Water for Chocolate. The book was actually my brother’s high school assigned reading, but I (four years his junior) picked it up one afternoon and couldn’t put it down until I finished. Needless to say, I didn’t understand much of the storyline, but I do remember being fascinated by Esquivel’s use of recipes to both provide structure as well as further the plot of the novel. I would like to read it again sometime. Mole was the dish that caught my attention because in my culinary repertoire, chocolate and chicken were not complementary ingredients. So when Sylvia told me she had made mole over the weekend and has brought some to share, I was very excited. The sweet, salty and nutty stew was rich and complicated, and I astonished her by finishing my portion and asking for more. I requested the recipe, and so here it is. I have yet to make this myself, but I will update when I do. This is my tribute to Sylvia Sosa, a memorable character in my life. Simmer chicken breast in salted water. Add garlic cloves. Once chicken is cooked, remove from water and cool. Shred once chicken has cooled. Add both jars of mole to about 2 cups of chicken stock and bring to a boil. Use enough liquid to create a thick, soupy consistency. Deep fry tortilla until crispy. Pan fry bread until crispy. Toast sesame seeds and pumpkin seeds. Do not use any extra oil. Adding a little at a time, use a blender to create a paste from the tortilla, bread, sesame seeds, pumpkin seeds and peanut butter. Add just enough chicken broth to make a paste. Add the paste and chocolate to the mole mixture and bring to a boil. Mix thoroughly. Add shredded chicken and simmer for 20 minutes on low heat. Serve with Mexican rice and warm tortillas. Brown the rice about 1 tbsp of oil. Add the tomato, onion and bell pepper, stirring for1 minute. Add the tomato sauce and stir for 1 minute. Add 4 cups of water, bouillon powder, cumin, pepper and garlic. Taste the broth and add extra seasonings if needed. Cover again and cook for 10 minutes or until rice reaches desired consistency. YUMMM! i probly won’t be able to try making this anytime soon, so if YOU do, please share. perhaps as another 11:30pm snack? thanks.